Brand Finance has recently released its analysis of the brand strength for the world’s 500 top banks. This annual review uses Brand Finance’s royalty relief methodology to estimate how much of a bank’s market value derives from its brand assets. Over the past few years, we have studied the relationship between brand strength and sustainability. 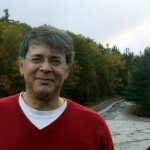 With help from both Brand Finance and other partners and data sources in the brand measurement space, we’ve determined there is a stable and reasonably strong correlation (between 10% and 30% depending on the source, time, period and type of data) between our data and these gages of corporate success. Therefore, we were not surprised to see that those banks who had big increases in brand strength also had big increases in sustainability performance and vice versa. The chart below shows companies who had a two step change in brand strength (e.g., from A to AA- or from AAA to AA+) on the horizontal axis compared to those who had a multi-point change in their overall CSRHub rating. 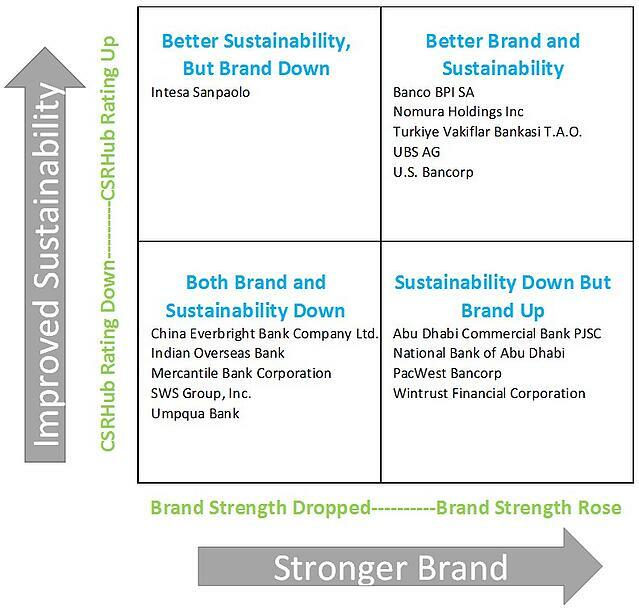 The top right and bottom right corners show banks where brand and sustainability score changes agree. There are always outliers in any analysis. So the presence of one bank (Intesa Sanpaolo) in the top left box didn’t bother us too much. However, there were four names in the bottom right box, that had brand strength increases but sustainability strength declines. A quick analysis shows that the driver for the change in perceived sustainability performance for these banks was governance issues—an area we’d previously showed did not have much affect on brand. These four banks showed relatively little change on the community, employee and environment issues that are most tied to brand. We look forward to working with more data from Brand Finance as they populate the rest of this year’s league tables. Our partnership with Brand Finance allows them to share details of our ratings with their clients. I’m sure that there will be many banks—and other companies—who will be interested to see how improving their sustainability performance could affect their brand values.